Firstly, apologies to those that have received this more than once. 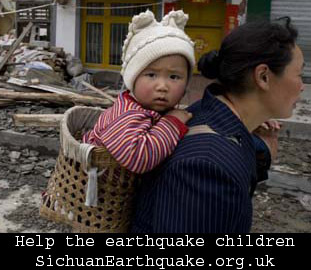 As you may know the BC Project has been working with various Chinese community groups over the past week to raise funds for the China earthquake appeal. Tonight, to coincide with the third day of mourning in China, the BC Project is co-organising a candlelight vigil for the earthquake victims. The vigil will be held tonight (Wednesday 21st May) at the London Chinatown Pagoda on Newport Place from 8pm - 11pm. If you’re free please do pop by and light a candle - we will observe 1 minute silence at 8.30, 9.30 and 10.30pm. If you can please tell your family, friends and colleagues about this too and thanks for your help and support https://frompharmacy.com/generic-viagra-online/.